Built in 1941 to service the nearby Umatilla Chemical Depot. The town is now mostly abandoned and taken over by the Depot itself. Ordnance was my home town. I spent my first three plus years, after coming home from St. Anthony’s Hospital in Pendleton, where I was born, My family lived on Bomb Street. We left in 1957, bound for northern Idaho, but my parents had many friends and we always visited the Hermiston area, so I have watched the decline of Ordnance. Your information is wrong in that the US Army Ordnance Depot does _not_ own the property on which the ghost town sits. The US Department of Defense (DoD) is indeed responsible for it being built and when we lived there, it was housing for workers on Defense projects, the most obvious being the Depot itself. My father qualified in that he was a construction worker on the McNary Dam, a US Army Corps of Engineers project. But, in the middle of the 1960s, the number of residents had declined with the increase in ready availability of automotive transport and the temptations of great choice in lifestyles in nearby Hermiston. So, the DoD put the entire town up for auction. A local agribusiness entrepreneur, state senator, and adviser to state governors, Stafford Hansell, bought the town, surrounded the entire town with fences, tore all the doors off all the units, and placed watering troughs throughout, and made the entire town in to a pig farm. That lasted for a couple of decades and, after Stafford passed, the pig farm disappeared. For years, though, it was a notorious location along the highway, then the new freeway, where auto passengers were forced to roll up their windows in a futile attempt to shut out the stench of pigs as they passed the town. So far as I know, the Hansell family still owns the property. I actually exited the freeway a couple of years back to visit the site…it was posted with Hansell Agriculture signs. At the time I lived there, the town ‘commercial district’ was right on US Highway 30 and had a gas station, a market, a barber shop and a concrete slab indoor space that was used as a roller rink. The curiosity which most enjoy hearing about Ordnance was the town’s street names. There was the Highway and 1st, 2nd, and maybe a 3rd avenue, but the cross streets were Arsenal, Bomb, Cannon, and Detonator streets. We lived on Bomb Street. Thanks you for the great story Kelly! My family (including grandparents and 3 sets of aunts and uncles and of course all the children) moved to Ordnance in December of 1947. We lived there while we were all building homes in Hermiston so were only at Ordnance for about 2 years. I lived on Explosive street first, then we moved to an apartment on Cartridge street. I know Bomb and Amitol were 2 other streets but do not remember the “D” name. Some of the apartments were furnished, others were not. I remember the coal bins at the street side where coal was delivered for the heating of our apartments. As kids we enjoyed going to the little store and the movies (cost was 10 cents for a movie ticket) that were held in the small complex there. There was also a grade school and my older sister attended at least through the 4th grade but I don’t know if any higher grades were there. We kids would play in the desert area just west of Amitol street where we would find agates in the sand and of course lots of large crickets that resided there. Roller skating was hard on the roads because they were not very smooth so we skated in the roller rink area (the concrete slab). If there is ever any further info regarding Ordnance, I would love to hear about it. I am putting together my life story and of course want to include that period of my life. Hello Lana! Thank you for stopping by. We’d all love to know more about Ordnance, but I suspect a lot of it maybe buried in governmental archives. Now I’d love to see a town map with street names. I know we lived on ‘Bomb Street’ and remembered others as ‘Arsenal’, ‘Cannon’, and ‘Detonator’ streets, but Lana says ‘Cartridge’ and ‘Amitol’. In looking at the street plan on Google Maps, it’s obvious that there were more than four ‘alphabet’ streets, so ‘Explosive’ makes sense. Was there an ‘F’ street? In 1946 my parents moved myself and 3 sisters to the ordinance. The second story apartment they were renting caught fire from another renter putting a lit cigarette into the office trash can. Office was the first floor. My father was not a veteran so he could not get help from the government. We lost everything in the fire. 8′ x 24′ mobile home in their yard to rent, and then they bought the house of their friends. Thank you so much for your memories Donna! Bill Linder says: I also grew up at Ordnance. We moved into Hermiston in late 1955 as they were going to sell it. Streets I know were Bomb, Detenator (which I lived on), Fuse, Springfield, Explosive, Cartridge, Amitol, Arsenal and Cannon. I believe there were a couple more but can’t remember the names. I went through the fifth grade at the grade school (the sixth grade class was in the same room). We were bussed into town starting my sixth grade year. They had sunday school in the community center for us kids. I remember Mrs. Blame (sp) as our teacher. We had a post office, 5 and dime, grocery store, fountain, hair salon and a locker for cold goods to be stored. We went to the maintenance shop and signed out tools and push lawn mowers to use and than signed them back in. I remember we had ice boxes, the old wood cook stoves and heating stoves used either coal or wood. It was a great place to grow up. I lived on amatol and ordnance..went to first thru Fifth grade there. My mother worked in grocery store and my dad of course worked at Depot and retired from there with 30 years. Rick, Is there a way to post a jpeg on here or send it to you for posting? In conversing with some of the people that had lived at Ordnance we’ve put together a map, numbered the streets and have a list of street names off to the side. If anyone can remember the street they lived on and where it was located on the map we will label that street. Maybe that way we can place all the street names on the map. Rick, thank you for posting the Ordnance map. We found that map (version 1962) which most closely reflected it as to what the people that lived there remember. 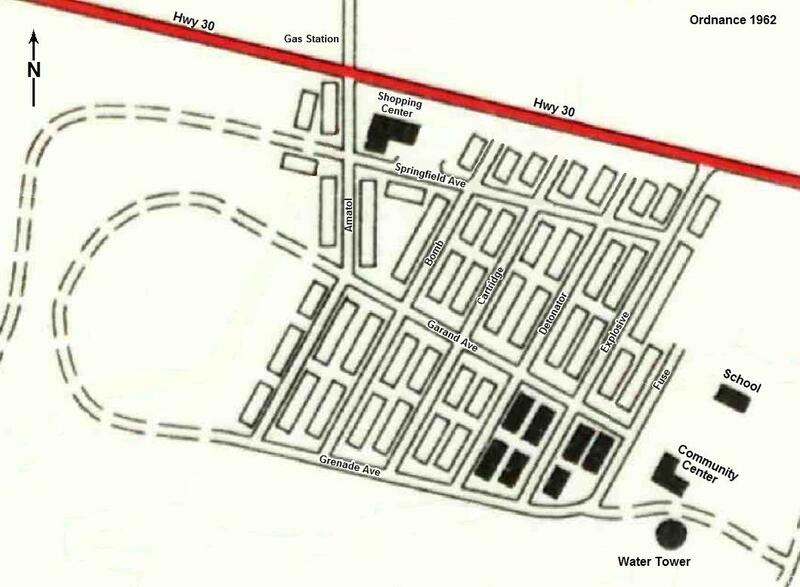 After talking with everyone we could find, and asking them what they remembered as to which street they lived on and where it was located, we labeled the streets as shown. We’re quite confident as to the labels with the exception of cross streets Garand and Grenade. They could be reversed or neither one correct as well. The streets we show are also referred to in Ron Ingle’s books “The Taming of the Desert” and “Oasis in the Desert”. If anyone has suggestions as to changes to the map, please let us know. It’s been fun reflecting back on those days at Ordnance with the kids that lived there. Yes…The map is great. I don’t see an ‘Arsenal’, nor a ‘Cannon’, so I may have imagined them. I left when I was three, so my memories are ragged, to say the least. I do remember going with other kids to catch horned toads in the desert just across the street that formed the south boundary of the town. (‘Grenade’?) And you didn’t have to go far, a few steps and you were in sagebrush. Kelly, yes, those were two street names we had left from our list, but one person that lived on Amatol said that was it’s name. Ron Ingle, in his book “The Taming of the Desert” listed the “C” street as Cartridge. He also said there were four, six, or eight units to a house. The houses positioned parallel to the street had that street as their address. So, there were none with an address on Garand or Grenade to confirm those street locations. Yes, multiple living units per structure. I’m not sure of the number per structure, but I do remember that we lived in the last unit on one side of Bomb Street and my father had added to the living unit our family was in by breaking down the wall between it and the next unit to double the size. I think that was done before I came home from the hospital..